A NEW research says that if a tax of 20 per cent is levied on sugar-sweetened beverages (SSBs), like soft drinks, it can help reduce obesity and diabetes. The study was published on January 7, 2014, in the journal PLoS Medicine. Such a measure, if put in place, could save 3.9 million Indian youth (25-44 year olds) from becoming overweight and prevent Type-2 diabetes in 400,000 people in the country from 2014-2023, says the study led by Sanjay Basu of Cardiovascular Institute, Stanford University, US. The study estimates that a tax of 20 per cent on sweetened beverages could prevent the problems of obesity and overweight in India by three per cent and reduce diabetes by 1.6 per cent in the next decade. According to the World Health Organization (WHO), nearly 13 per cent Indians are overweight or obese. WHO also says that India is presently home to 62 million diabetics, and by 2030, the figure is expected to be 79 million, much more than expected in America (30 million) and China (42 million) within the same period. 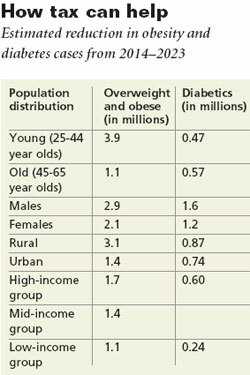 Diabetes is responsible for two per cent of all deaths in India on an average. Reducing non-communicable diseases, especially diabetes and obesity, is therefore crucial to the country. 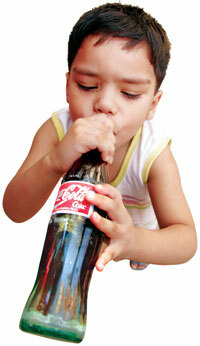 Doing this through taxing harmful and unhealthy products has been debated for a long time across the globe. The logic behind SSB tax, or “fat tax” when levied on food items that make one fat, is simple: taxes increase prices, which in turn decreases consumption, thereby reducing the risk of obesity, diabetes and other diseases. Denmark and New York have used this method to make an effort to shift from an unhealthy diet pattern to a healthy one. Denmark increased excise duties on chocolate, ice cream, sugary drinks and confectionary by 25 per cent in 2010 and introduced tax on foods containing more than 2.3 per cent saturated fat, such as meat, cheese, butter and edible oil, in 2011. “It is an effective method. The idea is to increase prices of unhealthy food through taxation and use that money to subsidise healthy foods like fruit and vegetables,” says Monika Arora, head of health promotion and tobacco control at the Public Health Foundation of India. The health effects of fat tax are yet to be confirmed, although there has been overwhelming evidence about the positive effect of increased tobacco prices. According to Dehran Swart from the National Council against Smoking in South Africa, high taxation on cigarettes has reduced smoking in the country by about 50 per cent in the past two decades. Some Indian states, too, have levied high duty on tobacco. In 2013, Rajasthan increased value added taxes on all tobacco products from 50 per cent to 65 per cent, while Jammu and Kashmir increased it from 30 per cent to 40 per cent in the same year. A perspective paper published in the same issue of PLoS Medicine has appreciated the study, but says that the validity of the proposed estimate will depend on how much tax manufacturers and retailers pass on to the consumer. If they do not increase the price of sweetened beverages significantly, then the proposed level of taxation will not help, the paper explains.